may also be used in conjunction with dental implants to restore strength and appearance following tooth loss. The function and location of the tooth being repaired or replaced often dictates the type of dental crown that will be needed. The best way to learn which type if right for your needs is by discussing your options with San Leandro cosmetic dentist Dr. Gary Fong. If you would like to learn which type of dental crown is right for you, please contact Gary G. Fong, DDS online or by calling 510-582-8727 to schedule a consultation. In some cases, ceramic materials are used for crowns as well, though these tend to be less reliable and often need to be replaced long before other dental crown options. 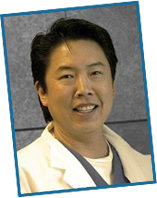 Dr. Fong prefers all-porcelain dental crowns due to their strength, reliability, and longevity. This particular dental crown material is easily bonded to the tooth, allowing for a more reliable hold and, because no metal is used, porcelain crowns do not require as much tooth preparation prior to placement. All dental crowns are shaped and sized to fit comfortably into your smile, but porcelain crowns offer the additional advantage of being shaded for seamless integration. Once placed, your dental crown will look and feel like a natural tooth, and function as one as well. All porcelain dental crowns are often, but not always the best solution for bite restoration. During your initial consultation Dr. Fong will assess your needs, discuss your options, and help you choose the dental crown that is best for you. To schedule your dental crown consultation with Dr. Fong, please contact us today. We welcome patients from San Leandro and surrounding areas at our comfortable Hayward office.